This year Lemon Press are proud to celebrate their 25th Anniversary. Over that time there have been huge technological advances. 1991 was a significant year for inventions and innovations that are commonplace today. If you’re over 25, how many of these events can you remember from 1991? Tim Berners-Lee invented the World Wide Web, built the first web browser, and the internet became available to the general public. There was no such thing as ‘high-speed’ when it came to internet connections. It was a dial-up modem, or nothing. The first web site was built at the CERN labs and put online on 6th August. The first GSM (Global System for Mobile Communications) network launched in Finland in 1991. SyQuest, manufacturers of removable cartridge hard disk drives, announced the SQ5110 and SQ800 to store, transfer and backup large amounts of data. Aldus PageMaker 4 for Macintosh is only really significant as it was the fore-runner to Adobe InDesign. Pagemaker was released in 1990 and a PC version was available in 1991. It slugged it out with Quark Xpress for dominance in the design industry for a few years before fading away. Quark XPress became widely used by professional designers, the typesetting industry, and printers. It was the industry leading software for several years, with a 95% market share, until Adobe InDesign eventually overtook it in popularity the early 2000’s. By 2004 Quark Xpress’s market share was reportedly down to 25%. 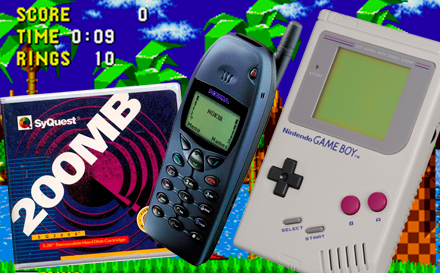 The Nintendo Game Boy turned Tetris into a phenomenon and re-invented the concept of handheld gaming. Sega releases Sonic the Hedgehog for the Sega Mega Drive. Sonic would go on to become Sega’s mascot. 25 years on we can see just how significant the year 1991 was, and how it has influenced our lives today. The Internet, gaming, mobile phones, design software, computers, microchips were all in their infancy in 1991. At Lemon Press we are proud to have reached our 25th Anniversary. We have always welcomed innovation and embraced change and look forward to our next 25 years!